Golden privet, also known by its Latin name ligustrum ovalifolium ‘Aureum’, is a popular choice for creating a reliable, large evergreen screening hedge. Golden privet is a cultivar developed from the oval-leaved privet and has variegated, glossy, rich yellow leaves with a bright green centre. Small panicles of creamy white flowers appear on the branches in July and are attractive to pollinators. Like the flowers, the glossy black fruits are small, but visible. Golden privet lends itself very well for hedging, featuring a dense growth habit, a fast growth rate and tolerance of trimming and pruning. In addition to being an excellent choice for hedging purposes, golden privet can be grown as a specimen shrub to fill an empty garden. Golden privet can be a great addition to large or average gardens, but if your garden is relatively small, it is better to choose an alternative, as this bushy shrub tends to grow quite large, not unlike many other privet species. If you provide it with the space it needs, ligustrum ovalifolium 'Aureum’ is a very valuable addition to your garden, as it is a very versatile hedge plant that can be formal as well as informal in appearance. A classic golden privet hedge is neatly pruned and has its flowers removed in the process, but it is possible to let it grow, which will not only enhance its natural, wild look, but also be beneficial to wildlife. Please note, however, that the flowers of this hedge plant have a very characteristic scent that not everyone appreciates. Unlike the wild privet or ligustrum vulgare, the golden privet is not native to the UK. The species originates from the Far East, from Korea and Japan to be exact. 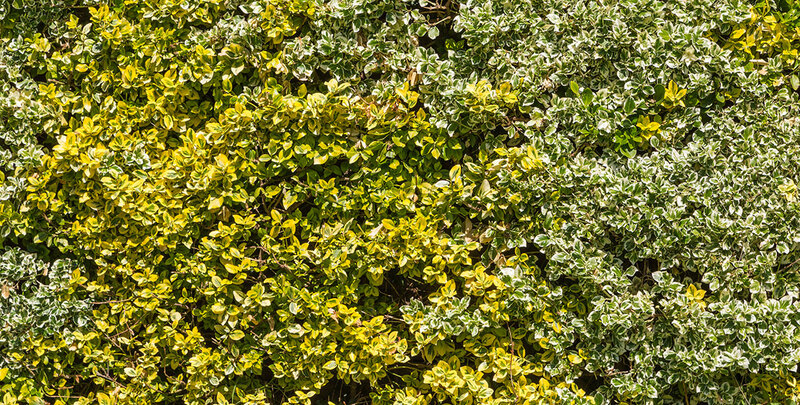 Since it is happy growing in our part of the world as well, golden privet hedges are mainly planted for the same reasons as wild privet hedges, as both ligustrum species have similar qualities. They are both ornamental plants that make excellent hedges for year-round screening, despite the fact that they are categorised as deciduous. The oval leaves of the golden privet will not retain its green colour throughout the winter. However, its leaves will remain on the plant until new growth forces them off in the spring. The foliage of the golden privet is able to survive most British winters. In the rare case that winter temperatures are significantly lower than usual, there is a chance that the golden privet will shed its leaves or at least a few of them. Though it will lose its screening qualities during such winters, new foliage will appear during the spring and therefore, there is no need to worry about the health of your golden privet hedge. In fact, the golden privet is able to cope with circumstances that most other hedging plants cannot deal with. Its resistance to pollution, for instance, has made it a popular choice for traditionally difficult urban gardens during the last two centuries. Ligustrum ovalifolium ‘Aureum’ is hardy, tough and evergreen, except for very cold winters, during which it may lose some of its leaves. Golden privet is highly tolerant of pollution and responds well to all kinds of pruning, allowing for both formal and more natural shapes. It can even be used for large topiary, provided it is clipped on a regular basis. Golden privet will thrive in the full sun, in partial shade or even in full shade in any soil other than wet sites. Waterlogging should be avoided, but exposed and coastal sites are no problem for this sturdy hedge plant, as long as the soil is free-draining. With an annual growth rate of approximately 20 centimetres, golden privet is somewhat less vigorous than many other privet species, but it compensates for that fact by being relatively low maintenance and more suitable for topiary compared to, for instance, the green privet. Many people choose to prune their golden privet hedge before its flowers appear in July, but this is by no means a necessity. Frequent pruning is essential to keep your golden privet hedge in check, but it will not grow completely out of control if you skip one of the bi-annual pruning sessions that most other privet varieties require. Why Choose a Golden Privet Hedge? If you are looking for a tough, yet elegant hedging plant that will thrive in virtually any soil type, the golden privet is the right hedging variety for you. A golden privet hedge will happily grow in conditions that are too difficult to cope with for many other plants commonly used for hedging. We would almost go as far to say that there hardly are any circumstances that this hedging plant can’t handle.